The Yupiteru MVT-6000 is the predecessor of the MVT-8000. 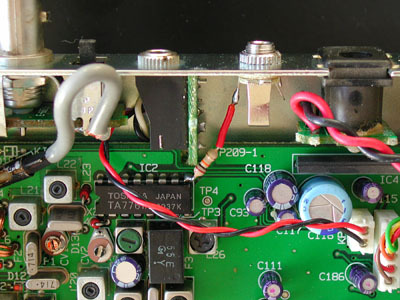 The scanner uses a DIL TA7761 receiver IC. The unfiltered discriminator signal can be found at pin 9. 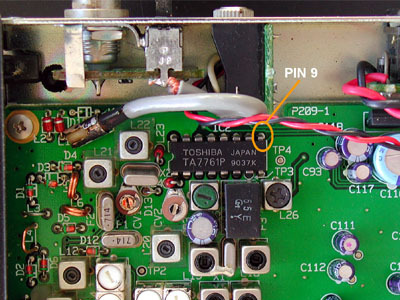 One lead of a 10 k resistor is soldered to pin 9 of the TA7761. A 3.5 mm chassis terminal is mounted in the back of the scanner between the headphone output and the DC connector. Beacause the distance to the discriminator IC is short, the other lead of the resistor can be soldered directly to the chassis terminal. I have put some isolating material around that lead of the resistor. The scanners's housing is grounded. Therefore, you don't need to connect the chassis terminal to ground separately.